*NOTE: "Homebodies" is what parents call themselves to make it seem like their lack of a social life is a personal preference, rather than a direct result of their children requiring dumb stuff like food and supervision. Of course having kids is totally worth being isolated from society, which is lucky because we already had four of them when we got married; adding another baby to the mix didn't exactly liven up our nightlife. I mean, we were certainly up really late, but not in the good way. 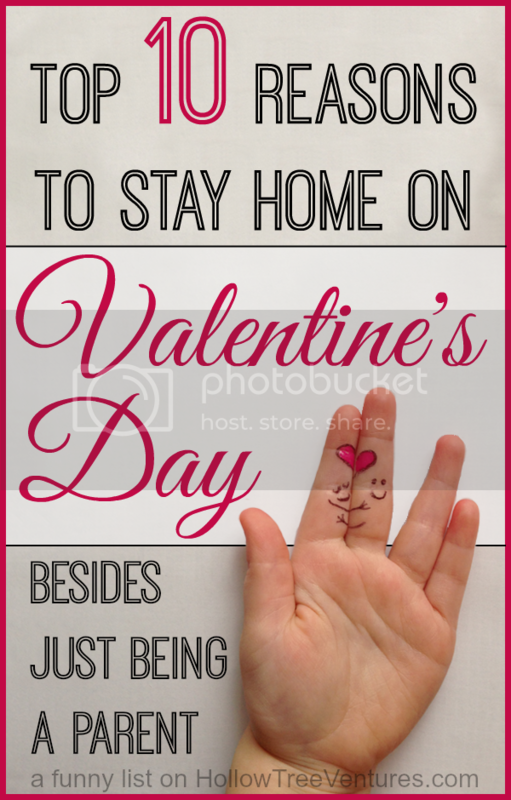 Several years later we're still not going anywhere farther than the fridge on Valentine's Day, so I came up with 10 new reasons parents can use for staying home that (mostly) sound better than being a loser - I mean, being a homebody. Feel free to borrow any of these excuses when someone asks you what your Big Plans are for the Big Day, and you don't want to tell them you'll be eating Cheetos on the couch until you pass out from exhaustion into a mound of orange cheese dust at 9:30 PM. Because you're ignoring it. It's just a commercial holiday anyway, invented by companies who mass-produce chocolates, greeting cards, and small red teddy bears holding stuffed hearts . . .
. . . and after buying all those chocolates, greeting cards, and adorable little teddy bears holding stuffed hearts, you can't afford three kernels of popcorn, let alone two whole movie tickets. You're too embarrassed classy to inhale that 5-pound economy-sized box of chocolates in public. You can't handle any more schmaltzy love garbage after filling out 50,000 SpongeBob valentines, which your kids begged for at the store but, apparently, have zero interest in signing. You'd rather have frozen pizza for dinner (again) than sit in an over-crowded Olive Garden waiting area for 90 minutes. Or even 2 minutes. You're not speaking to your spouse because he didn't get you a card - but he did send one to his mom (?!?). You're too tired to move after spending all afternoon chasing sugar-buzzed children around the classroom at your kid's Generic Unnamed Love-Based NOT-Valentine's Day February Holiday party. "Ooooh, I could get all dressed up, and do my hair, and wear mascara, and... Meh. Pajamas." You're avoiding contact with other humans for the duration of the Great Stomach Flu Plague of 2014. You suspect your babysitter might be some kind of deranged lunatic, because she said one of these 10 things you never want to hear your babysitter say. Oh, did I forget to mention that I have a super-helpful article on how to choose the perfect babysitter? You know, a sitter who won't steal all your silverware, or use a box of diapers to absorb the booze they spilled when they tried to consume the entire contents of your liquor cabinet. It's a quick read, and I promise you'll laugh at least as much as you did when you read those clever SpongeBob valentines. Maybe even more.